Surgical excision and primary closure is one of the surgical procedures which are used for the treatment of stable vitiligo over the lip region. 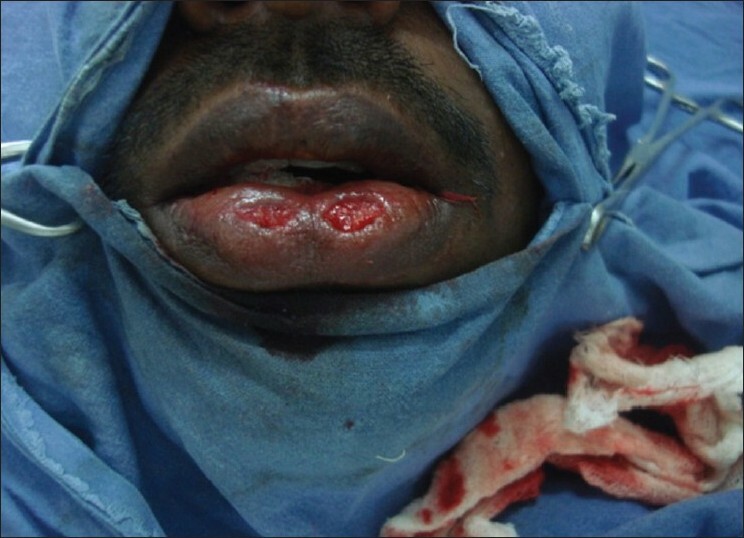 A 30-year old male patient presented with two de pigmented macular lesions on the lower lip since last 3-years. The patient had undergone treatment in the form of various topical agents and systemic drugs, but there was no response. The size of the lesion was stable for the past 2-years and there were no new lesions noted elsewhere on the body. 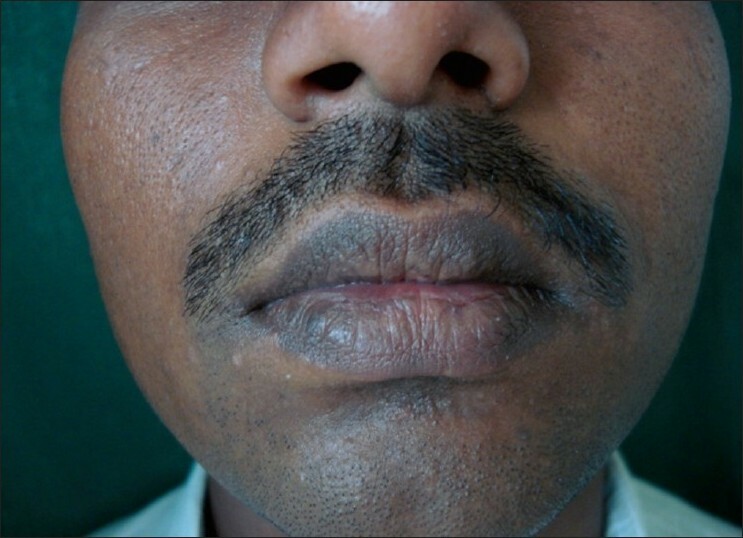 On examination, there were two de pigmented macules of size 1 × 0.5 cm on the midline of the lower lip [Figure 1]. A diagnosis of vitiligo was made on the basis of clinical findings. As the lesions were stable and the patient was not showing any response to medical treatment, surgical excision and primary closure were suggested as treatment to the patient. An informed consent was taken. Surgical excision of both the lesions was done with a number-15-blade [Figure 2]. Undermining was done with the blade and anterior and posterior borders of the wound were sutured using a 5-0 plain catgut suture [Figure 3]. Simple paraffin gauze dressing was done. Sutures were removed on the fifth day as by that time the healing was complete. No post-operative complications were noted [Figure 4]. However surgical excision and primary closure have certain advantages. This procedure gives immediate results as compared to other surgical modalities which take a long time to re pigment. There is no uncertainity of results like in other procedures. There is no risk of displacement of grafts like in skin grafting methods, no cobble stoning as in mini punch grafting, no post operative hyper pigmentation as in suction blister grafting, no special equipments required and no need to maintain patient on a liquid diet. The wound also heals fast. However, this method has some limitations. It cannot be performed for a larger area. It may lead to alteration in the shape of the lip if there is excessive tension on the wound edges. 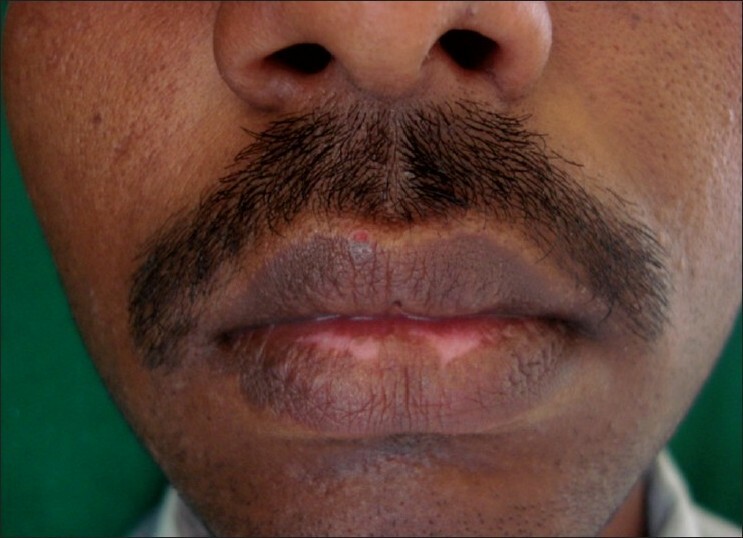 Excision, undermining and primary closure appears to be an effective method for treating small patches of lip vitiligo. 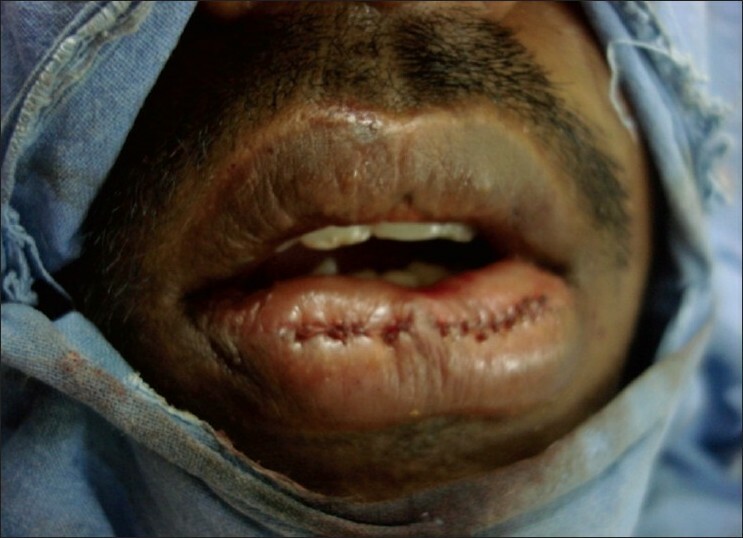 This case is presented to stress upon the effectiveness of surgical excision and primary closure in stable lip vitiligo, especially in patients not responding to medical treatment. 1. Falabella R. Pigmentation of leucoderma by minigrafts of normal pigmented autologus skin. J Dermatol. Surg. Oncol 1978;4:916-9. 2. Behl PN. Thin Thiersch's graft in the management of vitiligo. Asian Clin Dermatol 1994;1:69-76. 3. Kahn AM, Cohen MJ. Repigmentation in vitiligo patients. Melanocyte transfer via ultra thin grafts. J Dermatol.Surg-1999;25:69-670. 4. Gupta S, Sandhu K, Kanwar A, Kumar B. Melanocyte transfer via epidermal grafts for vitiligo of labial mucosa. J Dermatol Surg 2004;30:45-8. 5. Gupta L, Cappuro S, Melchi F, Primavera G, Bondanza S, Cancedda R, et al. Treatment of stable vitiligo by timed surgery and transplantation of cultured epidermal autografts. Archives of Dermatol 2000;136:1380-89.